Preschool. These days among a certain economic group it seems that preschool isn't an option anymore. It's what you do when they drive you crazy at home your child turns 3 or 4. We are lucky. We have over half a dozen schools within a mile and a half of our home. That's what we get for living in the middle of town, middle of the sirens, middle of the endless front-door solicitors, middle of the preschools. But options also mean a stupefying array of questions. What's the school's philosophy or model? Montessori, Waldorf, art-based, reading-based? Is the school accredited, are the teachers credentialed? Full day or half day? Potty-trained requirement or are diapers allowed? Lunches provided or lunches required? How much parental involvement is required? How sick is 'sick' and what happens when it's snowing? All this is great but we picked our first preschool because it was close and affordable. This year though, we were ready for a change. I knew what I school I wanted my daughter to attend. It's the local favorite. There's a waiting list but I had a slot. My daughter's best girlfriend already goes there. Her mom could pick up my girl in a pinch too. My doula once taught there. The cost was reasonable. It was an easy 8 minute drive. But we turned it down. Because every time I get in that car to drive my girl to school or pick her up, I feel like a schmuck. 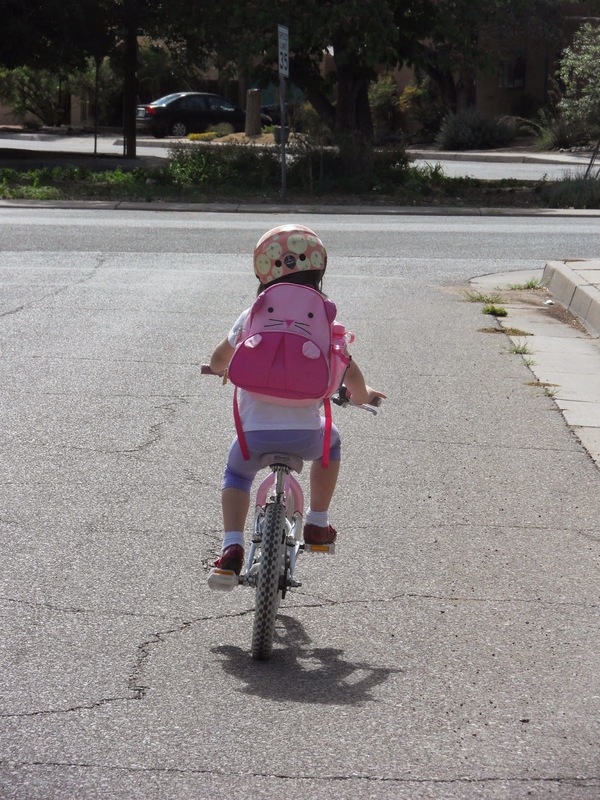 Why am I driving my daughter to school when we could walk or ride to a closer school? Walking or riding would be less wasteful and healthier. It would also be, and I am a firm believer in this, a more spiritual beginning to my daughter's day. An open-air commute lets you absorb the general tenor of the day, take in the unique fragrance that each day brings. I walked every morning, why couldn't my girl? So we picked a closer school. It wasn't the price we wanted to pay. My daughter didn't (yet) have any friends in class. It didn't even come with the effusive approval of my mommy circle. But guess what? They aren't beating my child or leaving her on the playground all day. She's learning letters and numbers and has already made a friend. It's fine. We're not tiger parents but we did accelerate her bike-riding lessons. And she loves it. It's great for her psyche, her heart and it sets an example. I'm not claiming the best example. Just an option other parents maybe haven't considered. As her fathers jokes, "It's good she's learning early because until she boards that plane for Stanford, she'll be riding to school." It's true. Another benefit of living in town. And no, I don't let her ride alone. I'm all for independence but I'm not for a night in the joint. 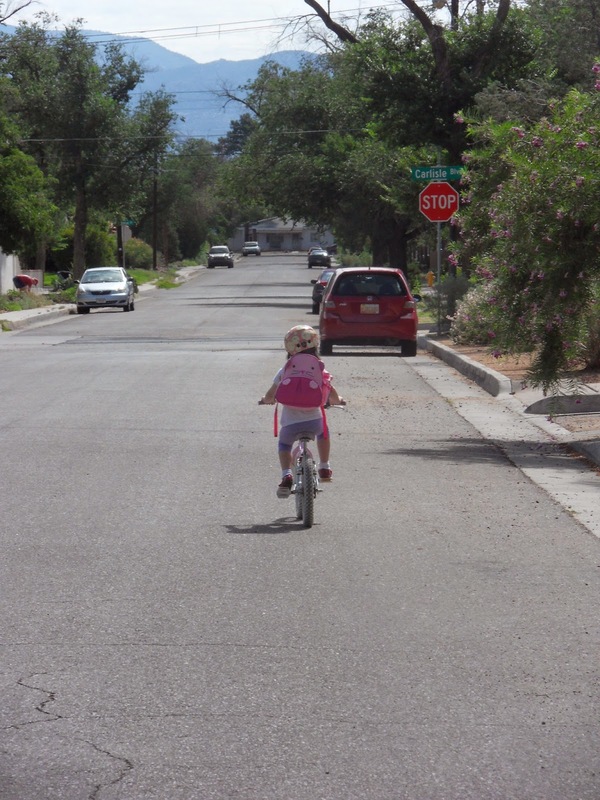 I ride along, with the toddler in a bike seat, looking out for cars. Right now, at the end of August, the weather is perfect, as I imagine it is in many other places across the country. It'll turn cool in a few months but we'll be able to handle it. And 'being able to handle it', whether turning down the better school or a colder commute, is something I'd like to instill in my girls. What happens when it rains? Close enough to still walk? Still close, a little over a half mile. We are also fortunate (at least concerning this issue) that it seldom rains here. It's true! The oldest had to ride on the crossbar for the first month in Panama until we procured some bikes. The local kids were so good at it. Our girl wasn't bad after a month but I was pretty happy when we got the bike seat taken care of.